The trumpet vine (Campsis radicans), also referred to as trumpet creeper, is a woody, deciduous vine native to the United States. The plant’s natural range covers the woodlands in the Southeast and Gulf Coast. The vine’s rapid growth rate makes it a widely used choice for covering unsightly fences, trellises, arbors and walls. Trumpet vine grows best when transplanted at a certain time of year. The Reader’s Digest Association’s “Care Free Plants” recommends transplanting the trumpet creeper during spring. Deciduous plants such as the trumpet vine adapt well to their new site when in their dormant state. Without leaves and flowers, they become well established before plants come out of dormancy and actively start producing foliage and flowers. Plant it early in the spring as soon as the ground is workable. Selecting the right soil and site for transplanting the vine is as important as is the right time of transplanting. 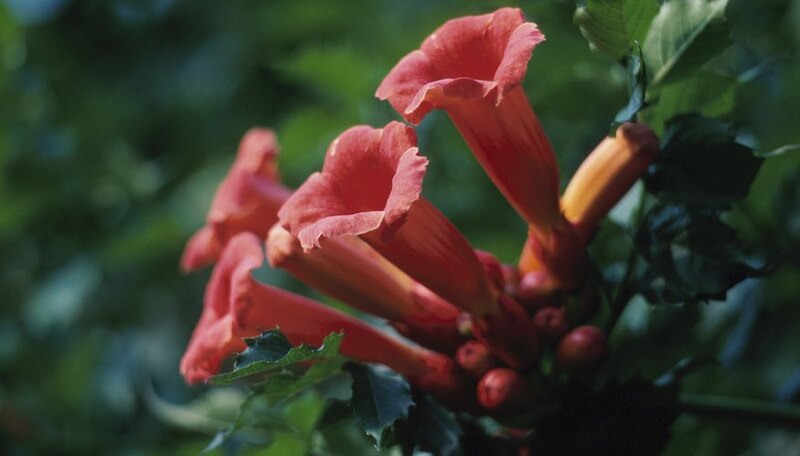 The trumpet vine grows well in areas with sunlight for at least half the day. Good sun exposure leads to prolific flower production. Although the plant adapts to a range of soil types, growth is best in moist, well-draining, fertile soil. The trumpet vine is hardy in U.S. Department of Agriculture plant hardiness zones 6 to 10. Newly transplanted young vines require help in climbing available support. Tie string to the vine through the first season of growth until the vine attaches to a support. The trumpet vine’s aerial roots produce a highly adhesive material that glues the plant to any structural support. This adhesive is strong enough to ruin the structure’s paint. Trumpet vines sucker profusely at the roots. Suckers are the smaller plants that start growing from the nodes on the plant’s horizontal roots. These suckers help the vine increase in width. Carefully remove suckers with roots and plant them in other areas to propagate new plants. It is also easy to grow trumpet vine from seed.